Tiny Mighty allows players to assemble their very own team of miniature Heroes, copying the iconic heroes from Marvel’s own franchise, the tiny characters in the game are fatter renamed imitations of classic characters such as “Arachnid” (Spider-Man), “Magnet Man” (Magneto), “The Rock” (Thing), “Gamble” (Gambit), “Human Fire” (Human Torch) and many more. The game boasts colourful graphics, plenty of features, quest based content and automated combat, all of which is free to play and can be accessed through any web browser on multiple platforms. The aim of the game is for players to build up a powerful team of Hero champions, taking them into battles and completing quests to push through the games storyline. Players start out by taking on their initial Hero “Dead Man” (essentially Ghost Rider) and working to building him up by earning Gold to increase his Skill attack, looting gear from completing level stages, and using it to upgrade him. The levels themselves follow the format of a single level broken up into different stages; players much complete these in order and earn Stars based off their performance, which can be used to unlock chest rewards. Each Hero available in the game has six gear slots that require a specific item in them acquired from completing specific stages (each item lets players know which stage they must complete to earn the item) and most items are required by more than one Hero. When a Hero has filled all six of their gear slots then that Hero can be upgraded to a higher Division; Green, Blue then Purple, which in turn absorbs the acquired gear and then requires new, more powerful gear items to be acquired and equipped. When a Hero levels up they will become more powerful and unlock a new skill that can be used in battle. Battles take the form of side scrolling areas, typically broken down into 3 or more areas, where enemies appear and the assembled heroes (5 max to a team) will attack them in a fully automated system. 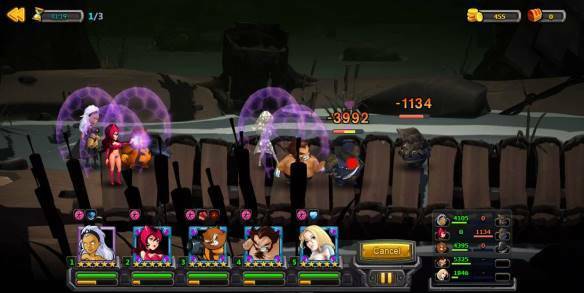 As Heroes deal damage they build up a Skill gauge to unleash their unlocked Skill attacks to deal great damage, heal, stun and other abilities; players must destroy all the enemies and the final bosses to complete the stage. Stages can be repeated over and over to acquire items, XP and Gold, they can also be Blitzed by spending Blitz Tokens which means players get the rewards without having to go through the actual stage itself. Players can acquire new Heroes through a variety of means, typically they will summon them using special resources at the Tavern, but they can also acquire them through story progression and even using the Lottery Wheel system which gives them a chance to win Heroes, XP, items, Gold and other goodies. Various features in the game are unlocked as players level up, including PVP, Dungeons and Events that can be accessed at certain times during the day.